No one seems upset, though: the two surviving Ornarans and the two surviving Brekkians both want to see their cargo right away. The Ornarans claim it’s theirs, because they paid for it, but the Brekkians claim it’s still theirs, since the payment was destroyed with the ship. 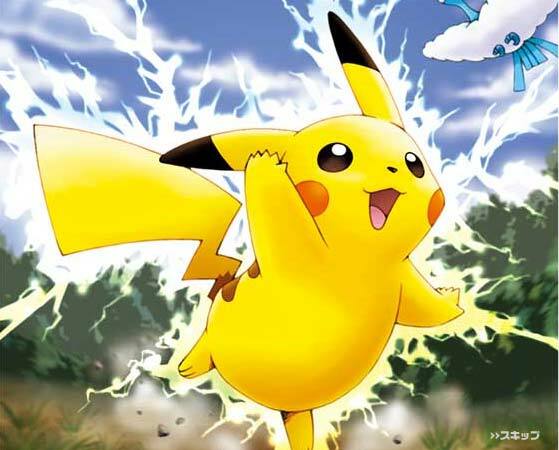 The two get into a lightning match Pokémon-style, because apparently both races have a natural electric charge. The cargo turns out to be felicium, a medicine for a plague exclusive to Ornaran that affects all inhabitants. Without it, the Ornarans will die. In fact, the two Ornarans who have beamed aboard–T’Jon and Romas–quickly begin suffering from the loss of the drug. Dr. Crusher can’t find any infection, but the symptoms are most certainly real. The Brekkians refuse to relinquish the cargo because Brekka has no other industries and supports itself exclusively with sales of felicium. The Ornarans’ dependence on this medicine means they export anything the Brekkians could ever need in exchange for the felicium. However, with T’Jon and Romas suffering, the Brekkians Sobi and Langor decide to give them each a single dose, to get them as far as Ornara for continued negotiations. WESLEY: Data, I can understand how this could happen to the Ornarans. What I can’t understand is why anyone would voluntarily become dependent on a chemical. TASHA: It doesn’t, but it makes you think it does. You have to understand, drugs can make you feel good. They make you feel on top of the world. You’re happy, sure of yourself, in control. TASHA: It doesn’t feel artificial until the drug wears off. Then you pay the price. Before you know it, you’re taking the drug not to feel good, but to keep from feeling bad. WESLEY: And that’s the trap? WESLEY: I guess I just don’t understand. Eventually the Enterprise reaches Ornara, and the Brekkians, fearful of the Ornarans’ surviving withdrawal from the drug and no longer requiring the felicium, decide to “gift” the cargo to the Ornarans and work out a payment plan later. Picard sees through this and comes up with the only way he feels he can help: he refuses to repair any of the shuttlecraft that shuttle the cargo back and forth, knowing full well that soon the supply line will break down, and with it, the drug addiction. This episode brought to you by Nancy Reagan. I had remembered this episode rather fondly. Maybe I had been taking some felicium myself, because this hasn’t aged well at all. I still give points for a premise that I haven’t seen anywhere else, before or since. Can you imagine the pitch? A planet of drug addicts manipulated into believing their withdrawal symptoms are a kind of plague, whose obsession with the drug has meant seeing all other forms of progress, like science and technology, take second place to the need for the next fix… and the drug addicts are the good guys? Yeah, okay. Watching this today, their “symbiosis” seems eerily prescient given the way incentives in the pharmaceutical industry favor long-term (and expensive) treatment of symptoms over short-term (less profitable) cures of conditions. Alas, that particular allegory is probably coincidental, as the obvious parallel is supposed to be to recreational drugs. Drugs make you dumb! Just say no! You’re being used! Yeah, whatever. Like most intelligent adults I’m allergic to the hard sell, and they’re trying oh so hard. This has one of the better guest casts: Merritt Butrick and Richard Lineback make convincing druggies, and Judson Scott and Kimberly Farr effectively convey loathsome yuppie-ish dealers. Butrick in particular twitches his way to several stolen scenes, giving Judson Scott a run for his money. Alas, their deliciously melodramatic performances are undermined by one of the worst actual teleplays that’s aired. There are no fewer than three condescending diatribes, the worst of which is the notorious Yar speech. But the Wesley scene everyone remembers really detracts from just how dreadful both Picard’s and Crusher’s moralizing is, too. Dr. Crusher comes across as an emotional loon, and I’m surprised she didn’t go straight to “Won’t somebody think of the children!” As the advocate for the viewer’s point of view, she embarrasses. Then Picard–oh, Picard–has to actually sell us the idea that allowing a planet full of people to suffer BEFORE they find out their lives have been a sham is the truly humane alternative to cutting to the chase right now. I understand the Prime Directive as a guideline for, you know, preventing the Fourth Reich, but this is ridiculous. These people aren’t just being exploited, they’re obviously suffering dramatically: a condition the Enterprise generally leaps at the opportunity of correcting. There’s just no precedent for this kind of wholesale back-turning on a people in obvious need. Picard’s “resolution” merely highlights the absurdity of the premise. If they can’t interfere when their own people are in danger (“Justice” or “Angel One“) or when other aliens are in danger (here), then what exactly are they supposed to do out there in the great big universe? Take notes in their travelogue and keep their uniforms neat? Surely Roddenberry didn’t intend this crew to have the most cruel hearts in the galaxy. Maybe all of these examples are just there to Teach Us A Lesson. Writers, if you’re going to write oversimplified morality tales, don’t insult our intelligence. Let us learn the lessons ourselves by showing your characters making mistakes and not just setting examples. Ultimately, I leave the episode thinking of a hundred alternative directions in which this could have been more interesting. What if felicium had side effects? What if it actually was a necessary medicine, and the Brekkians were exploiting that in a slightly more honest, less villainous way? Is there something inherently evil about controlling the supply of a necessary medicine, or is business just business? And hey, seriously, what about the children? Thread Alert: The ’70s are over! Why do they keep happening to this show?? If anyone looks like they’re going to snort coke off a disco floor, it’s these two. Best Line: LANGOR: The Ornarans provide us with the necessities of life, and we provide them with the necessities of living. It is a fair exchange. Trivia/Other Notes: This was Denise Crosby’s last episode before her timely death in next week’s “Skin of Evil.” (Though this aired first, it was shot after.) When Picard and Crusher leave the cargo bay at the end, you can see her waving goodbye in the background. Merrick Butrick and Judson Scott are both Trek veterans, having appeared in Star Trek II: The Wrath of Khan together. 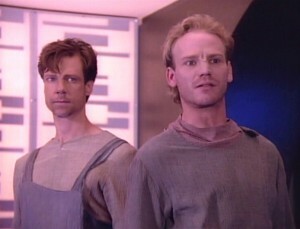 Though Scott returned to the franchise in Voyager, Butrick could not: he died the next year of AIDS-related illnesses. Anyway, Tasha’s horrible speech just undoes any redeeming features this episode had. After a couple of decades of PSAs with screeching capuchins and frying eggs, Just Say No and DARE, not to mention the plague of Very Special Episodes of any show that had more than one regular character under the age of 20, my tolerance for that sort of thing was long gone. And then so ham-fistedly done.Gah! But it’s better than next week’s episode. I still give this a higher rating because of my fondness for Merrick Butrick than it really deserves. There are so many episodes before this one that I can just find no redeeming value in that the mere presence Merrick offers makes me appreciate this one more. The drug message was definitely overhanded but at the time this thing first aired, there was a drug message practically ever week on one show or another. In that case, this one got bonus points from me simply because it involved people who had electrical powers. I also agree with Torie about the Prime Directive nonsense. If the first season is good for anything, it’s for establishing that the Prime Directive hurts more people than it helps. I can’t quite believe that no one working on the show noticed this and I kind of wonder if that was intentional. But I don’t quite get why they’re trying to say it all the time. Is it secretly an effort to get the public to back away from isolationism or something? So the noninterference directive allows them to freely render assistance to a ship in distress, but not a society in distress. Starfleet can render aid to oppressors (or not, apparently they have the option), but not the oppressed. OOookay. Look, I can understand the wisdom of the captain’s decisions. When Picard first gets involved, he doesn’t know he shouldn’t be involved. When Picard discovers that, he declines further involvement. You welcomed some guy into your home. He’s a terrible drug dealer. You’re under no obligation to continue the welcome. I just don’t see how or why it needs to be couched as some kind of difficult paradoxical, “oh dear, what now?” problem of the Prime Directive. There’s not really much of a Gordian Knot controversy or complexity here, and Doctor Beverly is just being histrionic again. Next time I deny a nickel to a hobo, I will deliver a lofty lecture like Picard’s about how centuries of hard lessons made this the only possible decision. The fact that it all gets easily resolved by an existentially broken widget (“diabolus ex machina”) just makes it simplistic. Easy to be virtuous, when the facts align to confirm your virtue. Had Picard sailed off with the drug dealers still fully in command of the situation, would we viewers still feel it was the “right thing” to do? That the Prime Directive still was omniscient and merciful? Well, it’s never proven conclusively that Brekka doesn’t also have a recreational drug problem. Maybe half their income is going to an anti-drug campaign! The thing is, aside from that one awful Yar speech, it’s not really a Very Special Episode. Wesley isn’t tempted into drugs, and I give the episode MASSIVE points for making the addicts sympathetic and likable, instead of the usual sleazy, no-goodniks in all the DARE crap I used to get. You wouldn’t see that today. He pulls off a tortured soul look really well. As for the Prime Directive, I think it was just an attempt to show how perfect and special the Federation is that they always do the Right Thing even when it feels wrong. Because being Right is hard, especially when it conflicts with any existing common sense notions of fairness and morality you may have. Honestly, this show makes me want to take up some vigilante justice. One other thing I forgot to mention: that opening was awful. The dramatic music cues and then–my favorite–the little CGI eclipse! Oh right, the frame narrative! And besides, in the opium trade, the British were initially looking for something they could export to pay for all the tea they were importing. What did Junkie Planet ever have that Pusher Planet wanted to get other than this soooper-advanced technology that Pusher Planet didn’t have? You know what happens in that case? Junkie Planet comes over with some guns and takes your medicine thankyouverymuch. It doesn’t decide to service the every need of technologically backward Pusher Planet. Aaaanyway… I also like the spot-on depiction of the tobacco industry — refining the product over the years to make it more and more addictive. the Prime Directive hurts more people than it helps. I can’t quite believe that no one working on the show noticed this and I kind of wonder if that was intentional. But I don’t quite get why they’re trying to say it all the time. Is it secretly an effort to get the public to back away from isolationism or something? The fact that the “moral” of the morality play always works in favor of the fetish is convenient. It would be interesting to see them visit a world where an easily eradicated evil was truly and thoroughly winning and flourishing, and apply those Federated principles of non-involvement. Now THAT would be television! And Picard agreed with them, but then announced that they couldn’t actually fix the starships. Prime Directive, don’t you know. If they can’t fix them themselves, they can’t fix them at all. Are you seriously telling me this policy isn’t insane? These are two cultures who know about the Federation. If anything, Picard should never have been able to offer to help fix their ships in the first place, but should have been able to say “you know you’re not sick, right? I mean, you’re addicted to that medicine. That’s all.” Certainly, there’s no possible justification to perpetuating a lie against a culture aware of space and of the Federation to begin with. Except, of course, the cold justification of social Darwinism. If David Marcus’s alien race is strong enough, they’ll survive the withdrawal symptoms, and figure out they’ve been duped. Of course, if Joachim’s race is strong and smart enough, they’ll figure out how to fix their own starship, and the next thing you know it all starts back up again. That’s life in the cold universe! I went into this with an open mind, wanting to see what it was that Torie liked about it so much (ha ha). Which may be why I ended up kind of enjoying a lot of it. Butrick was great, and I was actually entertained by the Ornarans’ blasé attitude toward everything. As Torie pointed out, this is a really interesting and different premise, and it mostly worked for me. Aside from the little “Just Say No” digression, Yar was surprisingly competent in this episode and this was Crosby’s best performance to date; perhaps she was just happy that it was all over. I can’t believe I forgot to look for her waving at the end! Troi was as irritating and useless as usual. Anyway, this had some good points, and whether you agree with Picard’s actions or not, I found it to be thought-provoking and engaging–a promising direction for the series, which will deliver better results when stronger writers are on board who won’t waste a good plot. A shaky Warp 3 from me. It would be fun to turn this episode on its head and imagine the Enterprise coming on these two societies at the outset of the plague. One society is suffering tremendously. The other has medicine, but can’t provide it because their ships are broken. Picard launches into some long lecture about how they’ve learned through hard experience that it would be folly to do anything to stop the suffering. Yar delivers the message that medicine = drugs. Weasley says he doesn’t understand any of this; and suddenly viewers realize they agree completely with this wise boy. Roll credits on Mirror Universe. @10 Lemnoc: You forgot a scene, where ISS Enterprise then delivers punitive orbital photon strikes to both planets for wasting their time. As far as invasions, it doesn’t look like the Ornarans have any weapons aside from their natural electrical charge, which the less said about the better. I hadn’t thought of it as a post-Vietnam reaction, but you’re right, it fits neatly into that narrative. Too bad the Ornarans didn’t have something the Federation wanted to prompt their intervention, eh? Another alternate plot: what if Picard decided not to help them not out of the Prime Directive, but for fear of the narcotic spreading throughout the Federation? It’d be an even better DARE message! My problem with this interpretation of the Prime Directive is that it precludes their own first contact. If the Vulcans had been playing by this rule of absolute non-interference with “lesser” species, humans would still be dicking around on Earth. Wow, a Warp 3! Are you sure you can sustain that speed? I think I would have liked Picard’s solution more if he hadn’t approached it with such disgust, as you said. It makes him come off as a condescending jerk, instead of a man caught between his personal morality and his mission instructions. For all you may think of the Pusher Planet, they’re still going to be left destitute once the export of felicium ends, and TOS-style they will have to learn to build their broken society from scratch. Picard doesn’t have any sympathy for that. Yeah — whatever happened to that electrical charge plot thread? That was one of like three different plot threads that was introduced, got two minutes of screen time, and then went totally nowhere. Like the solar flare thing at the beginning. Your explanation sounds like something the writers might have thought through at some later date to make sense out of nonsense (“we’ll welcome them to the satars when they’re ready for the stars”). Seems like I recall the Feds also only admitted members with cohesive planetary governments; balkanized govts seemed to be treated as client states. At this point and beyond, though, there is lots of nonsense. Why was junior Adm. Jameson trucking around with “his interpretation of the PD” in “Too Short A Season”? Why was Wesley tripping around on that planet in “Justice”? What the hell was the Enterprise doing even talking to that idiotic society in “Code of Honor”? in each case, they’re open about who they are, involve themselves seemingly under orders, then experience some catastrophe of noninvolvement. ADD: At least TOS put a fig leaf on some of this by costuming the crew on away missions to primitive societies. TNG deosn’t seem to have figured this out at this point. I remember the supposed limitation imposed by the Prime Directive about warp capability but for the life of me I can’t remember from where I recall it. It seems to me a late amendment to the rule. It makes sense, though, only for civilizations whose first contact with the inhabited Universe at large comes with the first development of FTL drive. What about first contact in other ways? What if a civilization happens to live right off the highway, so to speak, such that they might readily meet a more technologically advanced civilization just by stepping out the front door? And something like that has happened here. I just think that if the Prime Directive were really applied, in all cases, according to the hyperbolically strict guidelines that Picard occasionally lays down, the Enterprise shouldn’t even be openly gallivanting around the galaxy in a starship because they might accidentally run into someone whose cultural evolution might be disturbed by the mere sight of a huge alien vessel. I rather wonder how Capt. Kirk would have handled this situation. I imagine a (rather silly) scenario in which Kirk trumps up some excuse to throw the Ornarans in the brig indefinitely, giving the Brekkians and himself the excuse to confine the Ornarans long enough to achieve their withdrawal from the drug. I also imagine Dr. McCoy’s anger at the situation would be…volcanic. The way that Dr. Crusher’s objection to the situation is made to seem silly and emotional, a mere counterpoint to Capt. Picard’s ostensible Solomonic wisdom, is distasteful to say the least. And it would happen again in “Pen Pals”; Dr. Pulaski as I recall cuts a better figure, more clipped and forcible, but still her objection to the captain’s inaction exists merely to be refuted by Picard’s unchallenged sagacity and a fallacious slippery-slope argument. And that suggests a question. At any time during TNG was Picard’s reasoning ever allowed to be wrong? Well, there was that highly intriguing 2nd season episode “Time Squared” in which Picard is permitted to refute himself. And I suppose that Picard can be said to have lost the argument with Q in “Q Who”. There may be other examples I’m forgetting. In the main, though, Picard was almost always made out to be right no matter how specious his arguments. To be fair, Capt. Kirk was never wrong either, but he was James Kirk for crying out loud. I rather wonder how Capt. Kirk would have handled this situation. Challenges Judson Scott to personal combat with stakes being the loser withdraws forever. While the combat ensues [cue TOS combat score], McCoy whips up a synthesized replacement methadone. Departing victorious and virtuous, Spock muses aloud about the PD. Kirk delivers Rationalization #4 for ignoring it + a zinger. McCoy and Kirk chuckle together as Spock’s eyebrow lifts. All the talk about the prime directive in this thread has led me to see that it is at odds with the mission statement of the Enterprise (and the series). This episode has not held up for me though I still favor Picard’s decision at the end. Giving them the easy cure to the addiction would likely prove ineffective. If you have an easy way of dealing with the problems of the addiction when they get to too great, then what incentive do you have to try to avoid getting re-addicted? I have to wonder if this story idea started out focusing on something else but got changed in response to a round of politicians calling for Hollywood to stop being part of the problem and be a part of the cure in the War On Drugs. (Politicians have been doing that from time to time since at least the 60s as one of several tactics to try to show that they are worthy of being re-elected.) That Drugs Are Bad scene with Tasha and Wesley was out of place in this story but it was in line with the messages being inserted into other shows at the time. I dunno… part of me wants to agree with everyone that this wasn’t a good episode, for any and all of the reasons stated, but I still have a certain fondness for it. I know I’m in the minority, but it won’t be the first or last time. Look, at least this episode was ABOUT something. There was a moral issue, debate and dissension ensued, and there was a downbeat ending. It was a glimmer of a trace of what made TOS so good. Yes it may have been handled heavy-handedly, but it did do what TOS was so often praised for; couching a current day topic in SF trappings. I’ve said before and will say again that in terms of oversimplification and execution, this episode can be compared quite readily to “Let That Be Your Last Battlefield”. Both tackle contemporary issues ( racism / drug abuse ) both convey their message with all the subtlety of a jackhammer ( racism is BAD / drug abuse is BAD ) and both have alien races that can fight each other with personal energy fields. But at least this episode is ahead of turds like “Angel One”, “Justice” and “Code Of Honor ( which was truly about NOTHING ). I still like the fact that at the end of this episode, no character is truly happy or satisfied by the outcome, and there is no artificially light, warm and fuzzy wrap up moment tacked on to lighten the mood. And when all is said and done, the topic is still relevant today. 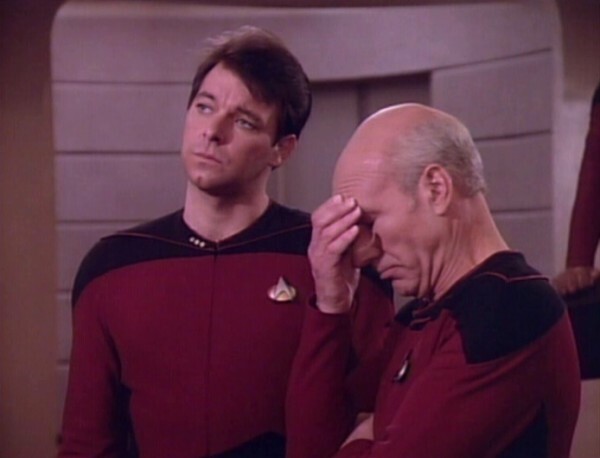 If suffering (and re-suffering) through pre- Best of Both Worlds TNG has taught me anything, it is that crap writers will use the Prime Directive to mean anything that will create some fake tension in their crap plots. It was kinda cool to see David Marcus and Joachim, though. I think the warp drive rule is introduced in First Contact. As for Picard always being right, I’d rather the show side with him than with their idiotic morality tales. Modifying it to “seek out new life and new civilizations as long as they’re socially and technologically backwards and can, through their nauseatingly simple errors, legitimize our own species’ superiority” was too long and doesn’t scan as nicely. Your hero, ladies and gentlemen? But I love a lot of season 3! Season 2 is an improvement, at least. “Measure of a Man”? “Q Who”? At least it has some memorable ideas (“Loud as a Whisper”) even if the episodes aren’t as strong as they will be. The problem with message stories is that they usually forget to be entertaining because they are too damn busy climbing up on their soapboxes to berate those of us not accepting of the piece of golden wisdom. To tell a story like this you have take the issue and disguise it in metaphor, but that was beyond these people. (Perhaps, and I am being charitable here, because things were being rushed rushed rushed because of the looming writer’s strike.) Also the drug problem is much more complex than what is presented here. The reduction has made any possible message inapplicable to the real world. As to the Prime Directive — well Trek was never consistent in exact;was, a statement of moral realtivity (something I hear Roddenberry defend in the years between TOS and TMP), an indicatore of advancement enough to contact (such as in first contact), an Athropological prinicple (such as when we see the federationduck blind for scienctist), or or a statement of fate such as when it is applied to natural disasters, it has been ALL these things. Mostly, as it has already been said, it was a crutch used by writers to introduce false drama and restrictions on the characters. My writing partner and I did submit an episode to Next gen where picard, is faced with a situation where by walking the talk of the PD is forced to let a planet die off, and is rewards with a medal for heroicaly resisting his cultural impulses to get involved. yeah they didn;t buy that one. That sounds like it would have been good. All angsty. Picard could have been takng crap from other officers even though the official attitude was “well done”.